High pressure water jetting uses special nozzles and flexible hoses to efficiently, economically, and environmentally safe clean drains and sewer pipes. Water is propelled under varying amounts of pressure into your sewer lines by a special nozzle mounted on the end of a heavy-duty hose that has an array of forward and reverse water jets. Powerful concentrated streams of water blast away the build-up inside the pipe walls. Even the toughest blockages and buildup can’t stand up to water jet! While “snaking a drain” can remove the clogged areas of a pipe only jetting can remove buildup that may cause “clog-prone” areas to keep your drains clean and free of blockages. 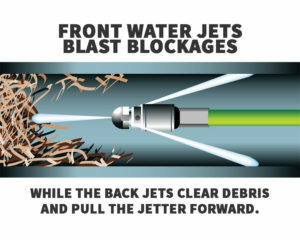 4,000 PSI High Pressure Water Jetting is the best method of sewer & drain cleaning available. Solid blockages are easily removed with grease, soap and sludge buildup on pipe walls disintegrated and washed away. Unlike cable or electric snake drain cleaning machines, jets of high pressure water scour the entire internal diameter of a pipe for maximum cleaning effectiveness. Who benefits from Hydro Jetting services? And anyone with Clogged or blocked drain pipes! Be sure to ask us about our maintenance plans to keep your drains unclogged and free of debris all year long.